Housing co-ops are developed to resolve the living need by offering an affordable and secure housing in a viable community. The members are tenants/owners having the ability to manage and control the co-op. There are two types of housing co-ops under Manitoba legislation, “Not-for profit” (a defined term) and all others. Not-for-profit housing co-ops are those where Articles of Incorporation specify that they are not-for-profit, that file income tax returns as a not-for-profit corporation or that have received from the Government of Canada or the Government of Manitoba or an agency of either one of them, a subsidy or assistance of a type that assisted with or reduced housing costs. Charitable organizations with similar purposes. Most housing co-ops in Manitoba are not-for-profit and were built with assistance from both the Government of Canada and the Government of Manitoba to provide affordable housing for low and moderate income families. Resident members purchase membership shares of the co-op in relatively small amounts (less than three months housing charges) and pay housing charges to cover mortgage interest, utilities, repairs, taxes, depreciation, management, administrative and other operating costs. When members leave the co-op they are entitled to have their shares redeemed by the co-op for the same price paid by the members unless the co-op has a deficit and is prevented by legislation from redeeming the shares. The other category of housing co-ops does not have the above restrictions and set their own rules for the amount of equity required to become a resident member and how members deal with their occupancy rights and shares when leaving. In most instances the exiting member gives the prescribed notice and on the exit date is no longer responsible for the housing charges and receives the acquisition price for the membership shares upon redemption less any pro rata portion of any capital impairment. In some of these co-ops the share capital is modest and similar to the not-for-profit housing co-ops and the co-op and the members’ cash flows are not significant. Other equity requirements are higher and members can reduce the monthly housing charges by increasing the share capital investment. However, upon leaving, the housing co-op may have to increase its mortgage, as the incoming member may not be able to invest as much in share capital as the exiting member. In these cases the exiting member may have to wait some time before being paid for all the shares redeemed. This can also put stress on the co-op if the mortgage holder does not feel the cash flow of the co-op is sufficient to warrant additional financing. Others are set up so that the exiting member is responsible for the housing charges until a replacement resident member is found. The new member pays the exiting member market value for the right to occupy the housing unit and the housing co-op records the transfer of equity and charges the new member an initiation fee. The housing co-op, although it still must approve the new member, receives the transfer fee but does not have to concern itself with the redemption of shares. 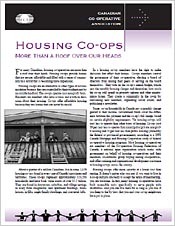 For more information please read about Housing Cooperatives (PDF).